A great evening for a ride with Jason on a cold and wet night in the valley. The trails were in not too bad of shape considering the moisture as of late, the few trails that were ridden that is. Old Timers, Gnome trail and lots of Multi use and paved. Wet roots had us on our heels on each big root run over as thoughts of "will this be it? Will this be the end of me?" raced through our minds. You could hear the trees laughing as their earthly appendages seemed to want to throw us off our bikes so we could be consumed by the trees and harvested into the next batch of Maple Syrup for local Smitty restaurants. That is where maple syrup comes from you know. The lost souls of mountain bikers... Ok, maybe I exaggerated that a bit. This ride was very uneventful so some improvisation was to be had. The ride was not boring by any means, it was great being out on a night knowing most of the city is on the couch. The valley was quiet and peaceful. Just the way I like it. In the end the cold got to us. Jason's toes, and my legs which didn't help my whole body. Improper pre ride planning should be blamed, but in the end I have that post ride glow which means things were great, despite the cold. 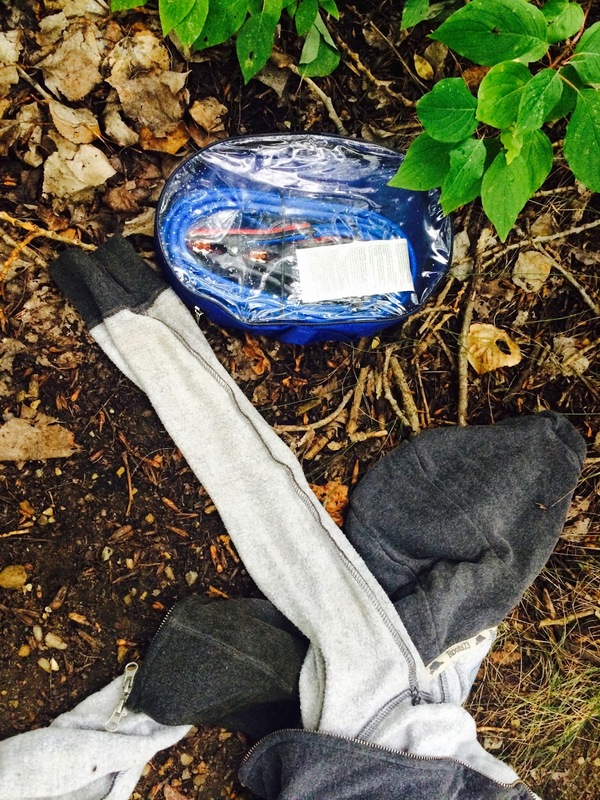 booster cables and a hoodie, how do booster cables end up on a trail?